Survivors of a stampede in Ivory Coast that killed 61 people, most of them children and teenagers, after a New Year’s Eve fireworks display said Wednesday that makeshift barricades stopped them from moving along a main boulevard, causing the crush of people. Ivory Coast police said unknown people put tree trunks across the Boulevard de la Republique where the trampling took place. “For security, because there were so many important people at the event, we closed certain main streets,” said a police officer who was overheard briefing Ivory Coast President Alassane Outtara on the incident. The police officer said the tree trunks were put out unofficially by people who are not known. 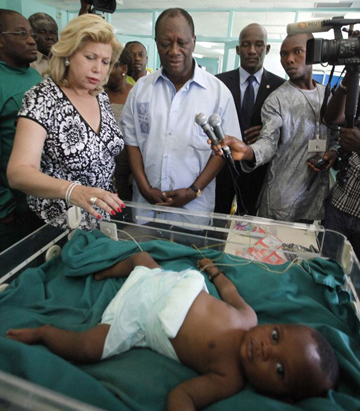 Ouattara ordered three days of national mourning and launched an investigation into the causes of the tragedy. Two survivors, in interviews with The Associated Press, indicated why so many died in what would normally be an open area, the Boulevard de la Republique. An estimated 50,000 people had gathered near the Felix Houphouet Boigny Stadium and elsewhere in Abidjan’s Plateau district to watch the fireworks. As they streamed away from the show some encountered the blockades. “Near the Justice Palace we were stopped by some people who put blockades of wood in the street,” 33-year-old Zoure Sanate said from her bed in Cocody Hospital. “They told us we must stay in the Plateau area until morning. None of us accepted to stay in Plateau until the morning for a celebration that ended at around 1 a.m.
Another hospital patient, Brahima Compaore, 39, said he also was caught in the pile of people stopped by the roadblock. Local newspapers are speculating that thieves put up the roadblocks so that pickpockets could steal money and mobile phones from the packed-in people. Ouattara pledged to get answers. Some observers wondered why police did not prevent the tragedy. Ouattara also postponed the traditional New Year’s receptions at his residence, which had been scheduled for Thursday and Friday. The leader of a human rights organization said that deadly incidents were predictable because the police and civil authorities had not taken adequate protective measures. The government organized the fireworks to celebrate Ivory Coast’s peace, after several months of political violence in early 2011 following disputed elections. Just one night before the New Year's incident, there had been a big concert at the Felix Houphouet-Boigny Stadium where American rap star Chris Brown performed. That Sunday night event was for the Kora Awards for African musicians. No serious incidents were reported from that event. In 2009, 22 people died and over 130 were injured in a stampede at a World Cup qualifying match at the Houphouet Boigny Stadium, prompting FIFA, soccer’s global governing body, to impose a fine of tens of thousands of dollars on Ivory Coast’s soccer federation. The stadium, which officially holds 35,000, was overcrowded at the time of the disaster. Another African stadium tragedy occurred on New Year’s Eve in Angola where 13 people, including four children, died in a stampede during a religious gathering at a sports stadium in Luanda, the capital. Angop, the Angolan news agency, cited officials as saying Tuesday that 120 people were also injured. The incident happened on New Year’s Eve when tens of thousands of people gathered at the stadium and panic ensued. Faustino Sebastiao, spokes­man for the national firefighters department, says those who died were crushed and asphyxiated. U.N. Secretary-General Ban Ki-moon expressed “deep sorrow” at the heavy human toll and put “a medical team and all available logistical means at the disposal of the government,” to help deal with the situation, U.N. spokesman Martin Nesirky said.